Take a good look at this picture. 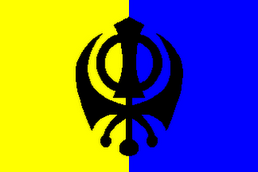 This is what a friend of the Sikh people looks like. 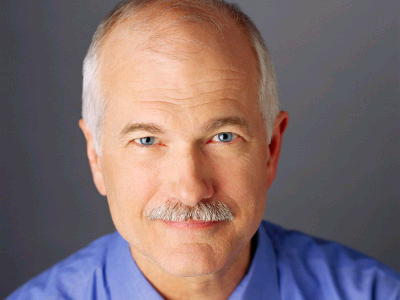 Mr. Jack Layton, Leader of the NDP. 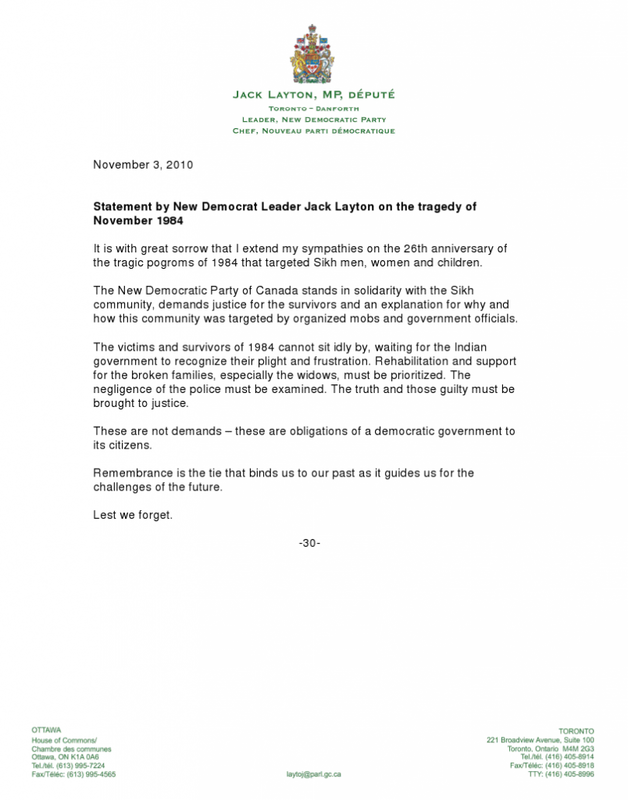 In the midst of this time of remembrance, we have gotten a gift of sorts from Jack LayTon, Leader of Canada's New Democratic Party - NDP (my party, if anyone's interested). 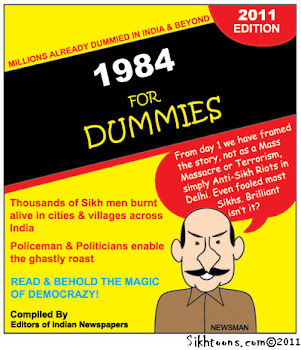 I am reproducing his statement below, courtesy of SAN (Sikh Activist Network). I ask all my Canadian readers to please call him at 416-405-8914 to thank him for taking this bold, courageous step on our behalf. Even if you aren't Canadian, I think a Thank you would be most appropriate. I also suggest you consider joining the NDP. That is a "Thank you that would be most appreciated. CALL JACK LAYTON AND THANK HIM NOW! It is with great sorrow that I extend my sympathies on the 26th anniversary of the tragic pogroms of 1984 that targeted Sikh men, women and children. 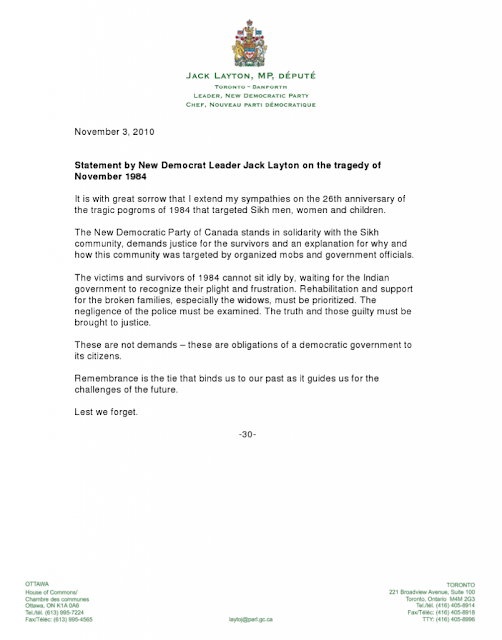 The New Democratic Party of Canada stands in solidarity with the Sikh community, demands justice for the survivors and an explanation for why and how this community was targeted by organized mobs and government officials. families, especially the widows, must be prioritized. The negligence of the police must be examined. The truth and those guilty must be brought to justice. These are not demands - these are obligations of a democratic government to its citizens. the challenges of the future. Thanks. I have just finished transcribing the statement so it can be copy/pasted. I'll post it in a few. I just pray that this isn't a political stunt to gain votes. Time shall reveal. And yes, I intend to thank the fellow for taking a bold step. It's not always easy to pay attention to what others choose to ignore. He's a good man. The only politician I say that about.